Elseworlds Trailer Gives Us a Quick Look at The CW's Crossover Event | Nerd Much? The CW’s big DC crossover event is just a few weeks away now. And to begin getting you hyped the network has released its first full Elseworlds trailer which features all of your favorites teaming up once again. In the Elseworlds trailer we get to see the shock and confusion that stems from the swapping of Oliver Queen and Barry Allen’s lives. We also get to see the introduction of Arkham Asylum’s Dr. John Deegan who is being played by the fantastic Jeremy Davies. There’s several versions of The Flash being teased too, including the version portrayed by John Wesley Shipp from the 1990 The Flash series. Ruby Rose’s Batwoman is briefly seen. The crossover’s events take place in Gotham, so her introduction will likely arise due to that. We get a quick cameo of Killer Frost too confirming the fan favorite’s inclusion. LaMonica Garret’s Mar Novu/Monitor looks to be a primary player too. 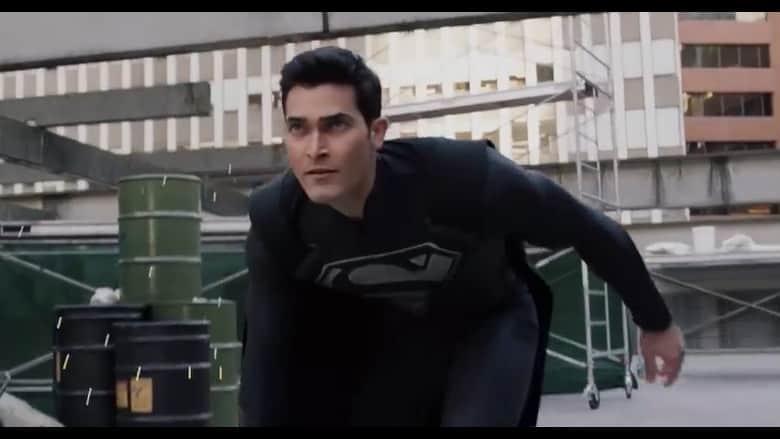 But the real star of the Elseworlds trailer is the return of Tyler Hoechlin as Superman. The clip actually wraps up teasing the introduction of character’s iconic black suit. We’ll have to wait and see how the creative team weaved it into the crossover event’s story. Elseworlds is a 3 night event that begins in Flash‘s time slot on December 9th. It continues in Arrow‘s slot on December 10th. And then concludes in Supergirl‘s regular time on December 11th. It’s the most wonderful time of the year for a reason, folks.